For use on a bench top or other custom mounting application that allows the operator hands free operation by controlling the unit with the foot switch. Contact the factory for modifications and adjustments needed. 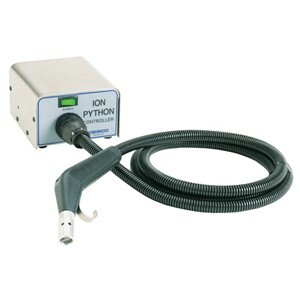 The Ion Python is a point-of-use ionizer using compressed air or nitrogen to neutralize electrostatic charges from a small, defined area and/or to facilitate removal of charged particles. These ready-to-use units are designed for use in applications and areas where ElectroStatic Attraction contamination create manufacturing or handling problems (Ref: ESD Handbook TR 20.20 paragraph 5.3.6.5.2.4 Point of Use Ionization). The Ion Python meets or exceeds the recommended technical requirements of ANSI/ESD S20.20 tested in accordance with ANSI/ESD S3.1. NOTE: Air nozzles are recommended for intermittent applications. They require filtered, dry, non-combustible gases, such as compressed shop air or nitrogen. If using nitrogen, contact the factory for modifications and adjustments needed.